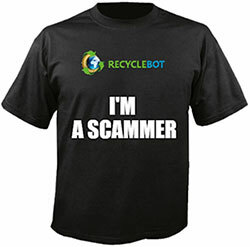 Recycle Bot selling Ponzi merch? The collapse of Laurie Suarez’s The Berlin Group Ponzi has taken a bizarre turn. Whereas The Berlin Group primarily operated their Recycle Bot via the Telegram messaging app, Suarez is launching his Ponzi reboot via a website. To that end The Recycle Bot website has been set up, and for some reason it has a merch store. A Recycle Bot polo shirt will set you back $46. A white t-shirt $25 and a cap $24. There’s also Recycle Bot branded mugs and mouse mats for $18. offering a 10% discount starting now until the 21st of December! All merchandise is purchasable using BTC LTC ETH only. Proceeds from the sale are assumed to funnel into Suarez’s back pocket. To add insult to industry; despite The Berlin Group’s collapse causing widespread investor losses, the Traffic Bot website boasts having 9230 investors who together lost almost $800,000. Meanwhile I want to know who is walking around in “I’m in a Ponzi scheme” apparel? I get the rahrah crap that’s handed out at scam events for Facebook photo ops, but this is actually clothing you have to want to buy with your own money… and then wear it. The good news is that given The Berlin Group’s relatively short shelf-life, it’s probable that the Recycle Bot will have collapsed before any merch is actually shipped.